Olin Tonatiuh (The Sun of Earthquake), also known as Nahui Olin (4-Earthquake), accompanies the previous four Suns. The image shows four numeral dots with him. This is the fifth of the Solar epochs; and it shows the ensuing destruction of the human race through earthquakes, fire and steam. We are the children of the fifth sun as represented by the very same Tonatiuh. The fifth race is also known with the name of the Arian race. “The formation of the sixth sub-race on the territory of the Red Skins was much more difficult, simply because the English conquerors destroyed and assassinated the natives rather than mixing and blending with them; such blending took place only at a very insignificant. For such a reason, the Occult Fraternity that governs the destinies of the world saw the need to turn the North American territories into a racial melting pot. It is in the United States that all the existing races of the world have come together to form the sixth sub-race, but with enormous difficulty. The sixth sub-race in Latin America was created with ease and this is something that should not be ignored by the authors of anthropogenesis and occultism. 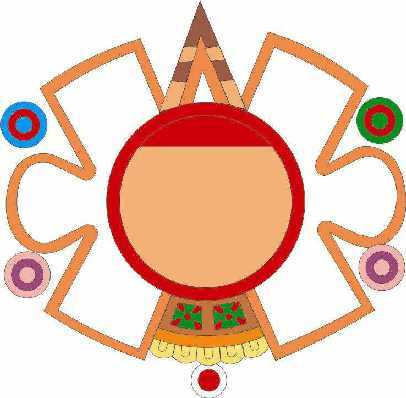 The Nahuas used to state we were the sons and daughters of the fifth sun, who will perish by fire and earthquakes. The end is clearly stated in the Stone of the Sun by the number 13 at the top center. Each planet harbors and develops seven races and then the planet dies. Our planet Earth finds itself at the very end of its fifth race. We could say our planet has “two races left” worth of living, meaning two solar cycles, and it will then become a corpse, a new moon. The Aztec calendar represents these cycles with the sign of the planet Venus and the ensuing races, the sixth and the seventh, to end with the eight sun, or the infinite. The sixth future race, or the new solar cycle will be known as the Koradhi race, but the name of the seventh and last race is still unknown. Some authors have referred to it as a race of Lilliputians. Similar to all previous races, the Arian race has lived its four epochs; Gold, Silver, Copper and Iron, manifesting now the very last epoch, where we once again have forgotten about the spiritual principles (the heart of the heavens), materialism has grown at the expense of the soul and its virtues, egotistical interests and wars are each day more tangible. The human being has forgotten its soul to dedicate itself more and more to its physical body. Sexual degeneration is clearly evident, the devastation of nature has gone beyond repair; with every day that goes by we can all see the increment in cruelty and hatred among men. Envy, greed and hatred grow unstoppably and all of humanity has submerged itself into an inhuman state that is now being accepted and considered as ‘natural’. •	To Sacrifice for Humanity; which is to give unto all other seeking souls the path towards self-realization. Gnosis is the torch that has been lit to alert and guide all those seeking for a radical change of their existence. “The distinct scenarios on which this humanity has evolved deserve to be considered and studied. How marvelous and full of wisdom are the Nahuan Suns. Not only they contemplate the race that perished devoured by the Tigers of Wisdom, but also the Hiperboreans that were abated by the hurricanes; the Lemurians who perished by the sun of rain and fire and great earthquakes; and the Atlanteans who perished by the waters. “Those Nahuan Suns go far; they contemplate the movements of the yolk on the egg whites, the periodical movements of the continents that approach each other just as soon as they separate and move apart, where great glacial ages lead to the destruction of all life and the renewal of activities.